TN considers increasing number of Sandhill Crane permits – WHY? FACT – only 98 hunters out of the 400 permitted ones (at least so far this 2016-2017 season) hunted Sandhill Cranes…so WHY is the Tennessee Wildlife Resources Agency (TWRA) suggesting the permit number go up to 773?? It just seems like a slap in the face of those of us who have opposed this hunt since it’s inception. I can understand the reasoning for going “statewide”…since I’m told FWS doesn’t like to authorize hunts on a county to county basis…but expanding the hunt to the upper limits seems a bit “showy” and as I said frankly an “in your face” type move on the Agency’s part. We know the hunt is going not going away…but compromise is always best when dealing with polar opinions and with wildlife watching on the rise and hunting on the decline I would have hoped that the Agency would take that into account and consider working with the non-consumptive communities as “we” seem to be the future. The TN Wildlife Commission is voting on these changes on Feb. 17th and will probably pass with little or no opposition from TWRA or the Commissioners themselves. Most especially because the Tennessee Wildlife Federation (TWF) has pushed, lobbied and given money for this for years. I’ve said it before and it bares repeating…I am NOT against hunting. It has it’s place in conservation and management as well as for recreation. What I’m not for is blatant disregard by the Wildlife Commission for those who don’t believe as they do and if the present recommendation is accepted as it is that is exactly what is happening. PLEASE call or email your TN Commissioner and let them know how you feel about Sandhill Crane hunting in TN. Over 3000 people from 18 different States, Canada and England attended the Crane Festival at Hiwassee vs the 98+ who hunted Sandhills…just something to consider. The following is a response to a question received by TWRA Wildlife Chief Daryl Ratajczak concerning the tracking method of numbers of Sandhills killed during Tennessee’s first season quota hunt. “…The U.S. Fish and Wildlife Service put a cap on how many birds each state could harvest. Kentucky was allowed to take 400 [a decrease of the initial limit set by USFWS] cranes while Tennessee was granted a potential harvest of 2,325 cranes. This is where the two states diverge drastically. Kentucky issued permits (two birds per hunter) to 332 [2013-14 season] hunters so technically, those hunters could have killed 664 birds. Since this is more than what the USFWS would allow, Kentucky hunters had to electronically report their harvest daily so they would not exceed the 400 bird mark. Therefore, they used a phone-in check system. While the first Tennessee Sandhill Crane season closed January 1, 2014, it is still unclear – seemingly even to TWRA – as to just how many Sandhills were actually killed by hunters? Immediately following the close of the first of a 3-year experimental season news coverage reported 118 birds killed with several more reports expected to “trickle in.” Then, when questioned almost two weeks later, TWRA gave other numbers as the final total. After the recent Tennessee Fish and Wildlife Commission meeting in Memphis the reported total number of cranes harvested is 309…maybe. What?! According to TWRA Wildlife Chief Daryl Ratajczak, there seems to have been a hold-up of TWRA bulk mailings at the U.S. post office resulting in “a large number of sandhill crane harvest reports…held up.” Read more here. If TWRA has no true idea of how many cranes were killed how can TWRA possibly monitor hunters and stop the hunt when the quota is met? If hunters were required to turn in tags at the end of the calendar day the crane was killed, why are reports still “trickling in?” Why was telecheck not used? During the Commission approval process the public was assured that communication with hunters would take place and hunters could check numbers – how is this possible with a postcard system? The process of relying on the postal service for on-going numbers and then admitting those mailings “were held up in the mail,” seems antiquated, non-communicative and not the best way to manage a quota hunt. This mis-handling of the season is disturbing and does nothing to instill public confidence in the agency claiming oversight in “management” of Tennessee’s Sandhills. On August 22, 2013, in seeming indifference to overwhelming public opposition to a hunt and against expert scientific data indicating a trend of declining productivity rates among Sandhill Cranes, the Wildlife Management Committee of the Tennessee Fish and Wildlife Commission (TWRC) voted to approve the state’s first Sandhill Crane hunting season. This morning the full TWRA commission voted and approved the season. As in Kentucky, USFWS mandates the hunt be a three-year experimental season to be reassessed at the end of that period. 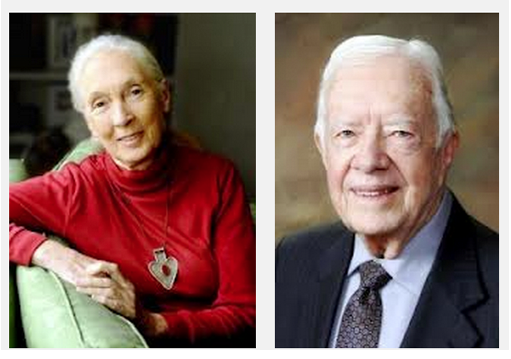 Former President Jimmy Carter and world-renowned animal researcher Dr. Jane Goodall publicly announced their opposition to the Tennessee Wildlife Resource Agency’s (TWRA) proposal to allow Sandhill Crane hunting in Tennessee. The proposal, set for a vote by the Tennessee Fish and Wildlife Commission (TFWC) on August 22 and 23 in Knoxville, allows for the issuance of permits to kill more than 2,300 Sandhill Cranes though experts warn that the endangered Whooping Crane is sure to be in the line of fire. Read The Tennessee Tribune story here. Despite the fact that both federal and TWRA public comment periods are now closed, those concerned about the proposed Sandhill season are encouraged to write their local newspapers – letters to the editor, OpEd pieces, etc., where one’s voice may still be heard. TWRC will be voting on the proposed rule at the August 22 meeting in Knoxville. The International Crane Foundation, a non-profit group, internationally recognized as one of THE leading experts in the study and conservation of the 15 species of cranes worldwide (one that neither endorses or opposes hunting) – responded to TWRA’s call for public input. Following is an excerpt from the document. To read the letter and assessment in its entirety click here International Crane Foundation assessment of the proposed Tennessee Sandhill Crane season. 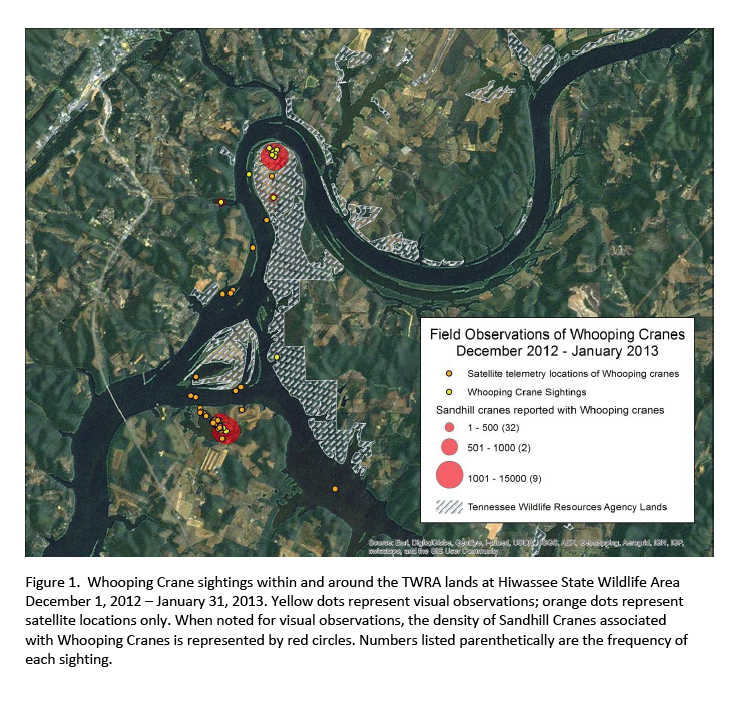 And the following concerning the Whooping Cranes present at Hiwassee. The proposed hunting season for Sandhill Cranes does not take sufficient steps to reduce the risk of accidental shooting of Whooping Cranes. …States, where legal harvest of Sandhill Cranes has overlapped with the presence of Whooping Cranes, have implemented several conservation measures to avoid accidental shootings. Measures include closures of areas to hunting when Whooping Cranes are present, ID tests for hunting license applicants, later opening hours to reduce mis-identification in low light circumstances and coordinating communication to hunters when Whooping Cranes are present in an area. Tennessee has many traditionally hunted game species. The Sandhill Crane has never been legally hunted in the state. Since the number of hunters is declining, and public opinion opposes a Sandhill hunt, why should another game species be added to the list? TWRA conducted a public opinion survey. There was little enthusiasm among hunters for a crane hunt, and most Tennessee residents were opposed. Even if the number of cranes is increasing in the state, why would you vote against public opinion? Hunters have the right to hunt game species. By choosing not to hunt Sandhill Cranes, hunters aren’t denied the right to hunt anything because these cranes have never been hunted in Tennessee. Seventy years ago Whooping Cranes had been extirpated from Eastern North America. Now there are a mere 104 birds after twelve years of reintroduction efforts. Why risk the accidental shooting of one of these precious birds that are found among Sandhill Cranes every day they are in Tennessee? Crop damage can’t be a huge financial issue in Tennessee because there are no row crops in the ground when the cranes are present in the state. If TWRA believes that cranes are causing crop damage, then the responsible thing to do would be to stop planting corn on the refuge. Since hunt clubs and private land where cranes would be feeding are immediately next to Hiwassee there would need to be a 5-mile buffer around the refuge. Shooting a low-flying crane coming off the roost, or standing foraging in a field wouldn’t be sporting. Thousands of people come to the Hiwassee Gazebo to watch cranes every day the cranes are present. 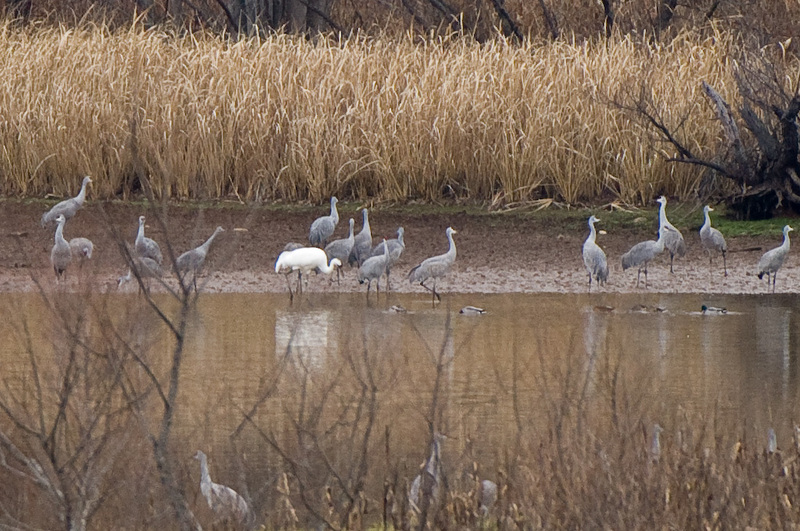 While maybe as many as 100,000 cranes visit the refuge and hunting won’t hurt the population, this is the only place a large species in huge numbers can predictably be seen in Tennessee. Hearing cranes shot, seeing crippled cranes, wouldn’t promote hunting or TWRA in Tennessee. For more talking points click here: Expanded talking points on potential crane hunt by subject. 1648 N. Dickerson Chapel Rd. The TWRA is soliciting input on a possible sandhill crane hunting season. The U.S. Fish and Wildlife Service has recommended a potential 60-day sandhill crane season, with 775 permits available (3 birds per permit). The sandhill crane zone would be restricted to the southeastern portion of the state (south of I-40, East of Hwy 56) where the majority of the birds migrate. To provide comments on the sandhill crane season, send emails to TWRA.Comment@tn.gov with the subject line “Sandhill Crane.” The U.S. Fish and Wildlife Service will also have a 10-day public comment period once the recommendation is published to the Federal Register in late July. Both the Waterfowl opening day survey and the TWRA sandhill crane comment period will be open until August 10, 2013. For those individuals without internet services, comments on both issues can be mailed to the Tennessee Wildlife Resources Agency, Attn: Sandhill Crane Hunt, P.O. Box 40747, Nashville, TN, 37204. Do you think TWRA should allow a 60-day Sandhill Crane hunting season? TWRA invested in an EXPENSIVE public survey that showed little to no interest in a Sandhill Crane (SACR) hunt, even among hunters, yet the agency has chosen to ignore the findings and push the hunt forward. Negative impact on TWRA (Agency) at a time when relationships between the Agency and wildlife watchers are at a high ( i.e. Land acquisition, reward money for Eagles, Discover Bird Children’s Activity book and TN Watchable Wildlife). Low reproduction rates of Sandhill Cranes. Public misconception about crop damage by cranes, fed by misinformation. Hunting will NOT solve crop damage – there is NO study to prove it. Depredation permits procedure is in place. If that system is “broken” then fix it. Non-hunting alternatives exist, are effective, are sustainable and are in use in the Midwest. Cranes overwinter at the Hiwassee WMA because TWRA plants corn to attract them and the shallow water makes for a good roosting site. WHOOPING CRANES! – They’re present the entire time SACR are at Hiwassee. This introduced population is essential to the recovery of the Eastern population. Not to even mention the huge investment of time and money that it takes to raise and release a single crane. COMMISSIONERS SHOULD REPRESENT THE WANTS AND NEEDS OF THE ENTIRE POPULATION OF TENNESSEE…NOT THE INTEREST OF A FEW INFLUENTIAL HUNTERS OR TWF MEMBERS. These birds do not BELONG to Tennessee…or Kentucky…they are part of the WHOLE Eastern Population we’re just lucky that they chose to stop here in Tennessee. So we should PROTECT them, NOT shoot them. When there are over 80 species to hunt in Tennessee why is there a pressing need to add another? Especially a tall, charismatic bird that could be used to educate the public about wildlife and habitat preservation. As a Watchable Wildlife opportunity, these cranes could bring tourism dollars to the State as has already been shown in Meigs and Rhea Counties with the annual Sandhill Crane Festival. Sandhill Cranes should be revered and watched. The Service Regulations Committee (SRC) of the USFWS has released the early season regulations of the proposed framework for the TN Sandhill Crane hunt. Details of the proposal were discussed/explained at yesterday’s Tennessee Fish & Wildlife Commission meeting just after results of the 2013 Public Survey were presented (a survey that indicates both a general lack of knowledge by the public about Sandhill Cranes and no widespread interest for hunting them). The proposed rule will be published in the USFWS Federal Register in late July and includes a 10 day public comment period. More information to come. The Tennessee Fish & Wildlife Commission meets next on August 22-23, 2013. At that meeting the Commission will make its recommendations on finalizations for the TN season framework and vote to accept it. NOW IS THE TIME FOR ALL OPPOSED TO THE PROPOSED TENNESSEE SEASON TO CONTACT YOUR DISTRICT COMMISSIONER, GOVERNOR AND DIRECTOR OF TWRA TO VOICE YOUR OPINION! 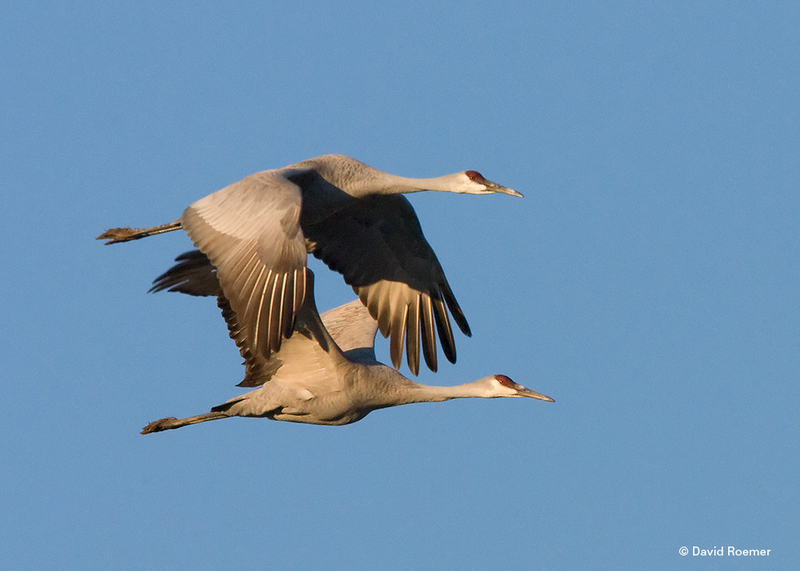 (See contact list above) The Eastern population of Sandhill Cranes doesn’t belong to the states they migrate over or to the states in which they stage. The cranes belong to EVERYONE in the Atlantic and Mississippi Flyways (eastern U.S.) and need to be viewed and valued as such. What happens in one state affects the entire population. The “Tennessee Residents’ and Hunters’ Knowledge of and Opinions on Sandhill Cranes, 2013” study was conducted for the Tennessee Wildlife Resources Agency (TWRA) by Responsive Management of Harrisonburg, VA. The telephone survey questionnaire was developed cooperatively by Responsive Management and the TWRA. Responsive Management’s Executive Director, Mark Duda, will present the results of the survey to the Commissioners at the TWRA Wildlife Management Committee meeting this Thursday, June 27 at 1:00. The purpose of the survey was to determine Tennessee residents’ and hunters’ knowledge of and experiences with sandhill cranes, their opinions on hunting sandhill cranes, and their experiences with the annual Tennessee Sandhill Crane Festival. The study entailed a telephone survey of residents of the state as a whole, a sample of residents of counties in which the Hiwassee Wildlife Management Area is located, and a sample of hunters in the state as a whole. The Tennessee Wildlife Resources Commission holds meetings about once a month to discuss and vote on issues concerning Tennessee’s regulations on hunting, fishing, and outdoor recreation. The public is always encouraged to attend TWRC meetings. The 2013 Tennessee Sandhill Crane Festival THANKS YOU for attending and making our weekend a huge success! Over 1,800 people attended the 2013 Tennessee Sandhill Crane Festival from 14 states as well as South Africa and Australia. It was a terrific weekend. Beautiful weather, many smiling faces and lots of wildlife. This extraordinary concentration of Tennessee’s tallest birds occurs every November through February, and viewing is always open to the public at the Tennessee Wildlife Resource Agency’s Hiwassee Refuge in East Tennessee. So if you didn’t get a chance to join us at the Festival plan a trip on down to Hiwassee some time soon and enjoy these most watchable species of wildlife! NASHVILLE — The Tennessee Wildlife Resources Commission has delayed a decision for at least to two years to move forward through the regulation process and request the U.S. Fish and Wildlife Service to establish a hunting season for sandhill cranes in the state. The decision came in a vote by the commission at its January meeting which concluded Friday at the Tennessee Wildlife Resources Agency Region II Ray Bell Building. A lengthy discussion was held during the wildlife portion of the committee meetings on Thursday. The commission heard presentations from Tim White, TWRA Migratory Game Bird Coordinator and Jim Kelley of the USFWS. The TWRC also heard opinions from representatives on both sides of the issue. A draft hunt plan by the TWRA had been presented to the commission at the June 2010 meeting for a 2011-12 season. This plan was approved by the Mississippi and Atlantic Flyway Councils in July 2010. The commission had directed the agency to develop this plan as a result of a request made by the Tennessee Wildlife Federation. A period for accepting public comments began last fall concerning the possibility of the establishment of a sandhill crane hunting season and continued until prior to the TWRC meeting. “…The question remains, does the Management Plan for the Eastern Population have the science to support the hunting objective that is currently included in the Plan? Many of us would like to see that science revisited; there are many deficiencies in available knowledge about the Eastern Population that are identified within the Plan, itself. Additionally, some kind of equitable representation of opposing views on that level seems warranted, since any state that hunts the Eastern Population impacts the entire population.